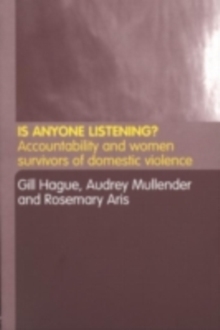 `The research methodology and the problems encountered when studying a subject such as domestic violence, coupled with the ethical problems of researching with children, are discussed at length in the book. This gives a good insight into the intricacies of conducting such a research study. The research looked not only at children who were known to have direct contact with domestic violence, but also what children in general thought and felt about domestic violence. The presentation of the findings, both in tabular and narrative form, was well presented' -Accident and Emergency Nursing Journal `This book offers accessible and interesting reading. There are a lot of pointers for the way forward in terms of both policy and practice. 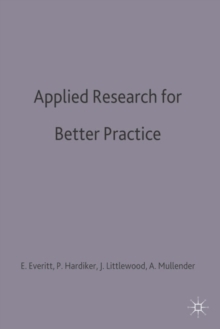 This is likely to become a seminal text' - Research Policy and Planning'This is a useful and challenging read for all of us who seek to work effectively and ethically in this complex area of practice' - Professional Social Work`Just looking at the authors of this book tells the reader that they are about to embark on a pioneering piece of academic research... a comprehensive and authoritative piece of work' - Domestic Abuse Quarterly`A vital tool for all those working with children' - ChildRight'Written in a lucid style and is easy to read... it is essential reading for all students in social work undergraduate courses and also in post-qualifying courses on child welfare and protection. 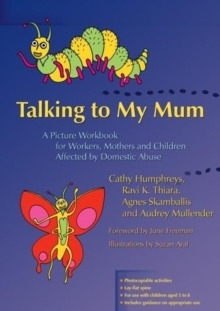 In addition professionals who are directly working in the area of child protection, schools and criminal justice settings would find this book informative and useful in understanding what children and young people want, and need, in relation to living in domestic violence situations' - Child and Family Social Work'This book is powerfully written and is essential reading for professional working with and supporting abused women and their children. Its groundbreaking focus on children's experiences adds much to our understanding of the complexities of domestic violence' - Journal of Family Studies'A treasure-chest of rich, diverse and powerful extracts from children and young people... in particular the material presented on different coping strategies used by children who have experienced domestic violence is an important contribution to an area about which very little is known' - Adoption and Fostering Journal How do children who live with domestic violence cope? How do they make sense of their experiences? 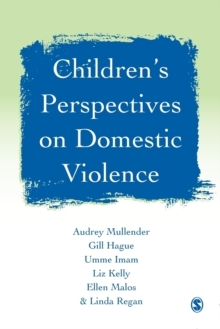 Do they receive the right sort of help from formal and informal sources?Drawing on the newest research designed to hear the voices of children and young people, this important book examines children's experiences and perspectives on living with domestic violence. The authors explore:- the effect of domestic violence on children- what children say would help them most in coping with domestic violence- the advice children would offer other children who find themselves in similar circumstances, their mothers and the helping professions. 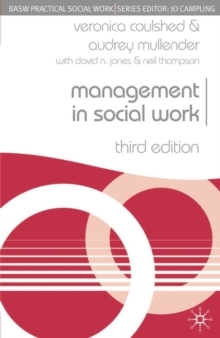 This accessible book written for students, their teachers, researchers and all those working with children - across social work, health, child psychology and psychiatry, the law and education - will provide a vital insight into children's own perspectives on domestic violence.